This is Roland’s Bible School building. 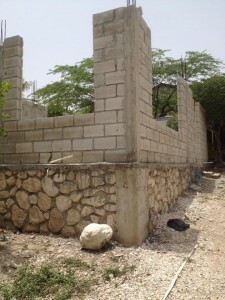 Praise the Lord a team from Calvary Chapel in NJ raised the funds to do the foundation and put up the walls. Doors, windows and a concrete roof are still needed. Cost. $3,000.00. This is a very worthwhile project. Roland and his daughter, Rebecca, conduct a Bible School here for the neighborhood children every Saturday. Roland’s wife also cooks a meal for the children when funds are available. Roland wants a concrete roof on this building because his plans are to build a second story to have a full time medical clinic right there. This would be run by his son, Clifford, the doctor, Rebecca, the nurse, and Rolanda, the Lab Tech (when money and or lab equipment is donated). These are the 3 oldest of Roland’s children, and thanks to generous faithful sponsors, these young adults have an education and skill that will help the people of Haiti.